Hessea is a genus in the Amaryllidaceae family from Southern Africa. It has 13 species, with 8 from the Cape region. 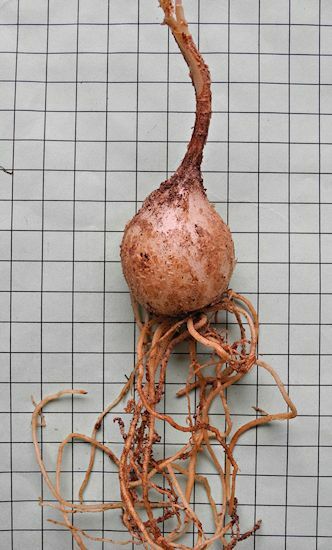 The rootstock is a bulb and plants have two or three leaves and flower in the fall before the leaves appear or with the leaves emerging with the flowers. Flowers are small, star to funnel shaped, formed in an umbel and usually pink or white, sometimes with dark central markings. In the wild they can be found in large colonies as they flower synchronously; larger colonies in flower can be spectacular. Most of the species are pollinated by bees, but some flies and other insects are also involved. 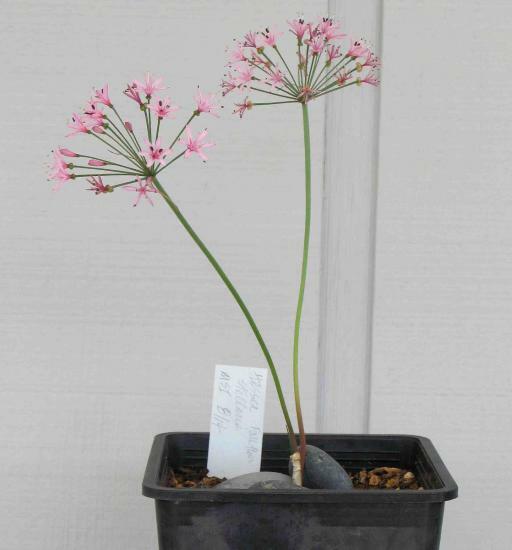 This genus is very similar to Strumaria and some people find them difficult to distinguish. Grown from seed they bloom from the third season on. More information can be found in Snijman, 1994, described in References. 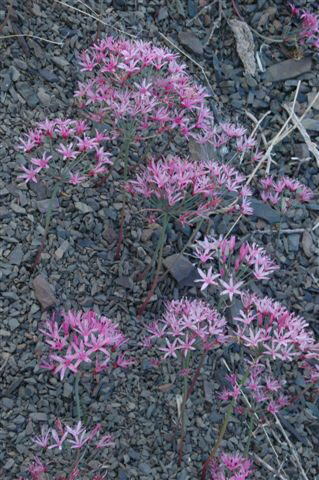 Hessea breviflora Herbert is native to the Northwest and Southwest Cape where it grows in sandy pockets between rocks on lower slopes. 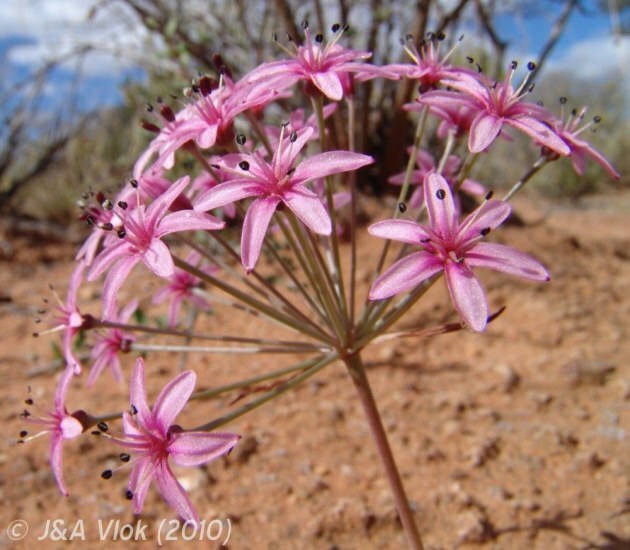 It is one of the showiest species with lovely pink umbels of densely packed flowers, about 12 to 15 cm in diameter. 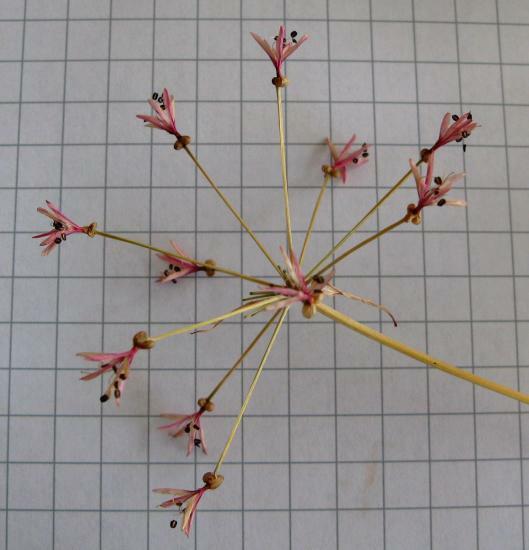 After the flowers are finished, seeds are formed quickly and the umbel breaks off and rolls in the wind, similar to Brunsvigia. 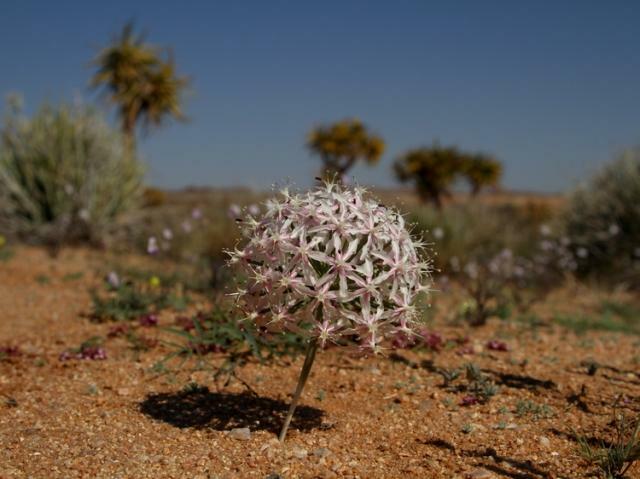 The first photo was taken by Rob Scott near Springbok in Namaqualand. The second photo was taken by Alan Horstmann. Hessea cinnamomea (L'Hér.) 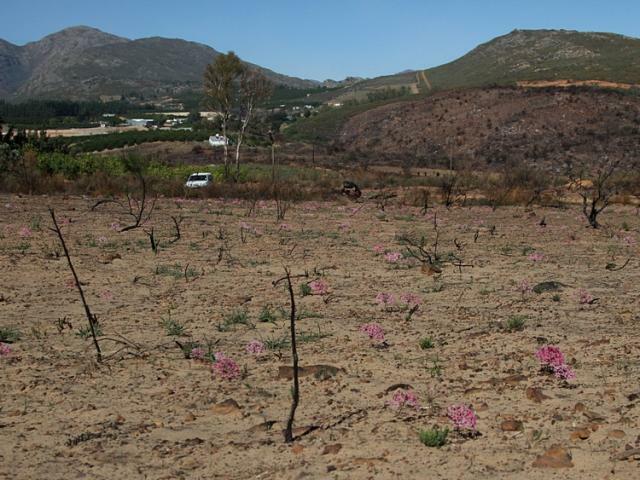 T.Durand & Schinz is found in peaty lowlands in the southwest Cape where it flowers after fires. It has glistening white to pink flowers with a wine red center and smells of spice. 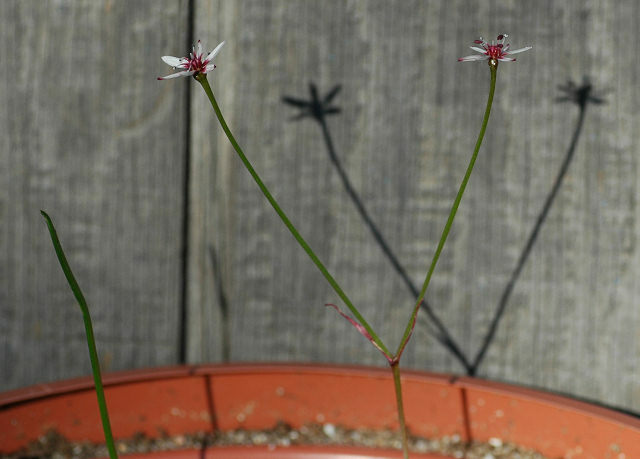 It is not easy to flower in cultivation. Photo by Cameron McMaster taken in the Overberg. Hessea mathewsii W.F.Barker grows to 19 cm tall. 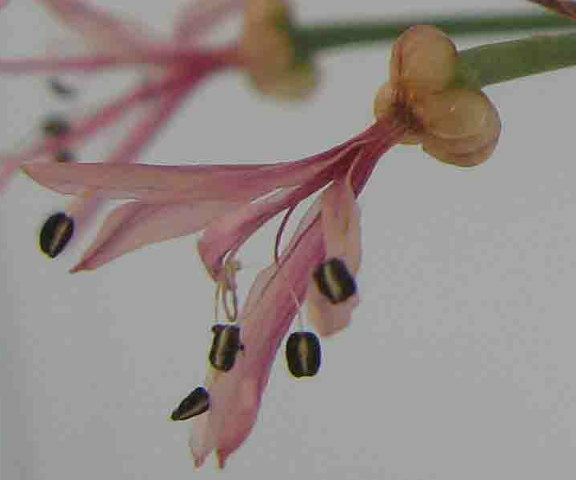 It has two to three leaves emerging with the flowers or dry at flowering. 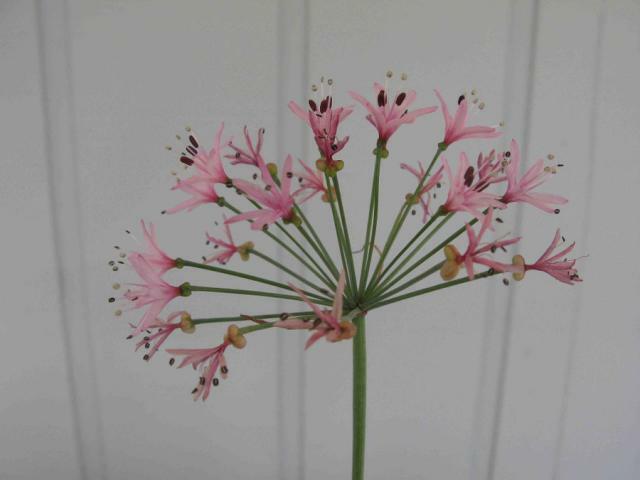 It has star shaped white to pink flowers with a deep pink to crimson center. 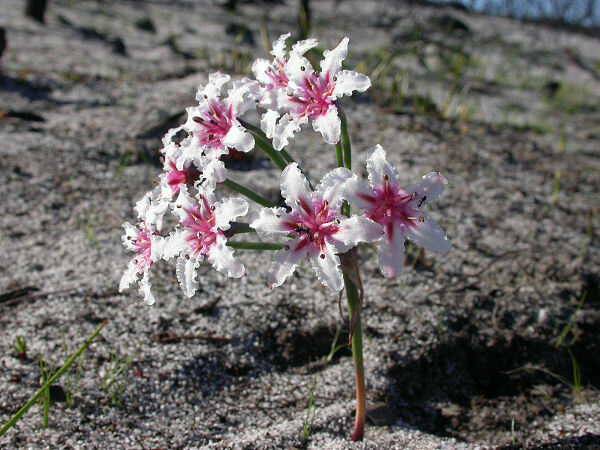 This species grows on limestone flats in the southwest Cape. It is an endangered species which is threatened by habitat destruction. Flowering for the first time from seed in November 2008, the flowers were very tiny. 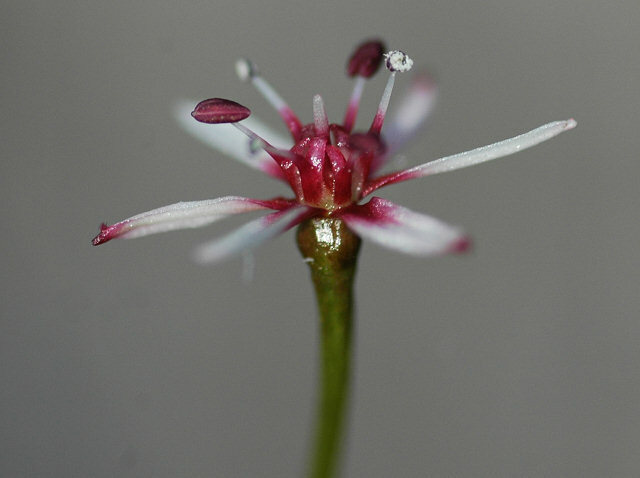 Photos by Mary Sue Ittner of the bud, flowers, stem. 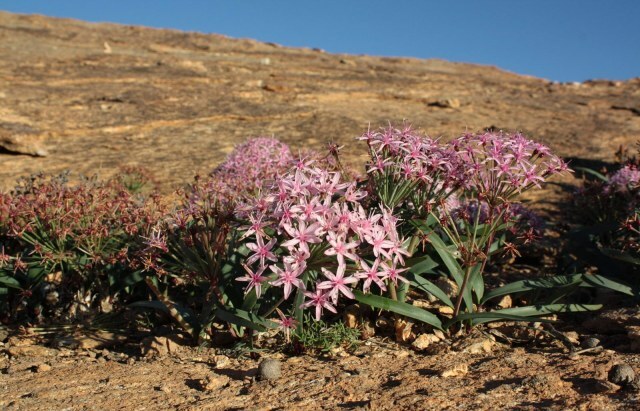 Hessea monticola Snijman is native to the Northwest and Southwest Cape where it grows on rocky slopes or in seasonally wet valleys. 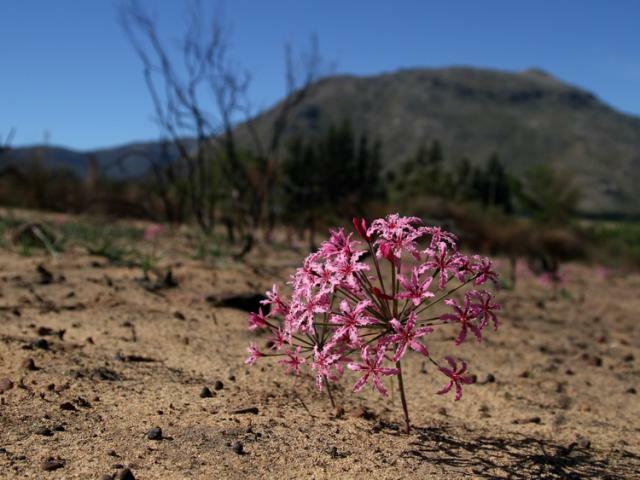 The photos below were taken by Rob Scott in the Cederberg after a fire. 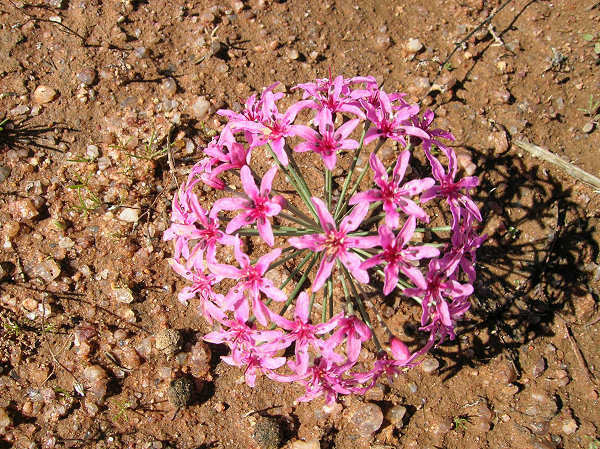 Hessea pilosula D.Müll.-Doblies & U.Müll.-Doblies grows in deep coarse sand in the Springbok area of Namaqualand and in deep red sand along the northwest coast. 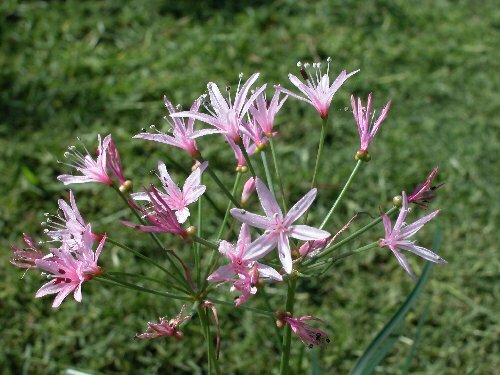 It has pale pink flowers with a white or deeper pink center. Photo by Alan Horstmann. 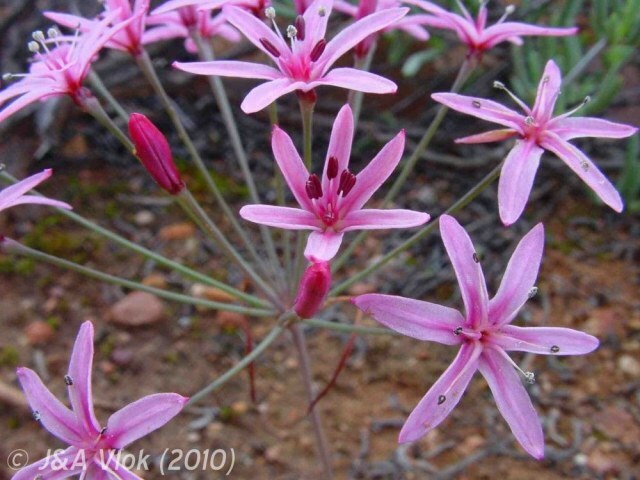 Hessea speciosa Snijman is native from Namibia to the Western Cape Province. The photo below was taken by Rob Scott near Pofadder. 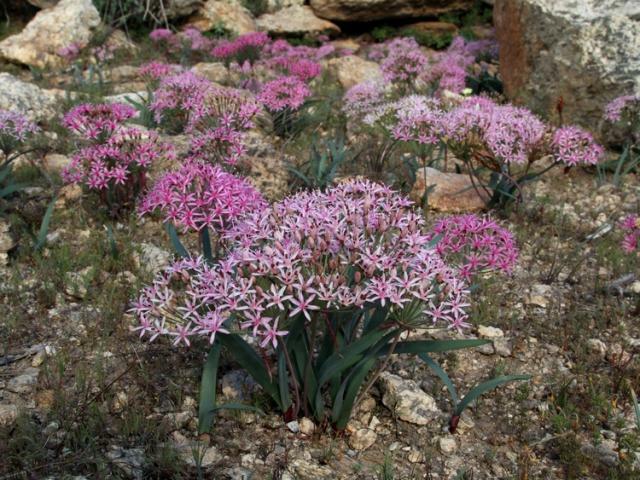 Hessea stellaris (Jacquin) Herbert grows on sandy or clay flats from the northwest Cape to the western Karoo. 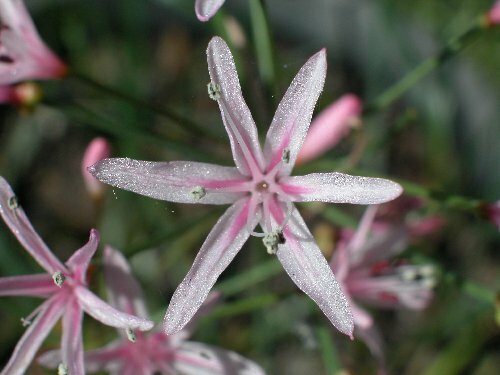 Growing to around 20 cm high, it has two recurved, narrowly strap shaped leaves and pale to deep pink flowers with a darker pink star shaped center. It flowers in fall, April to June. The first photo was taken by Rachel Saunders on Vanrhyns Pass. The next two photos from the book Plants of the Klein Karoo courtesy of Jan and Anne Lise Schutte-Vlok. The last two photos were taken by Andrew Harvie. 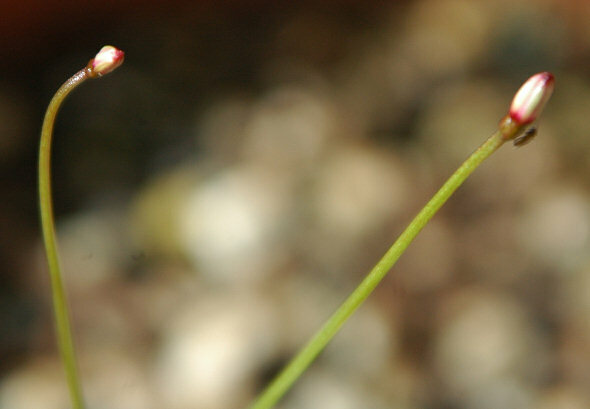 The first photo taken by Mary Sue Ittner shows a bulb on a 1 cm grid. 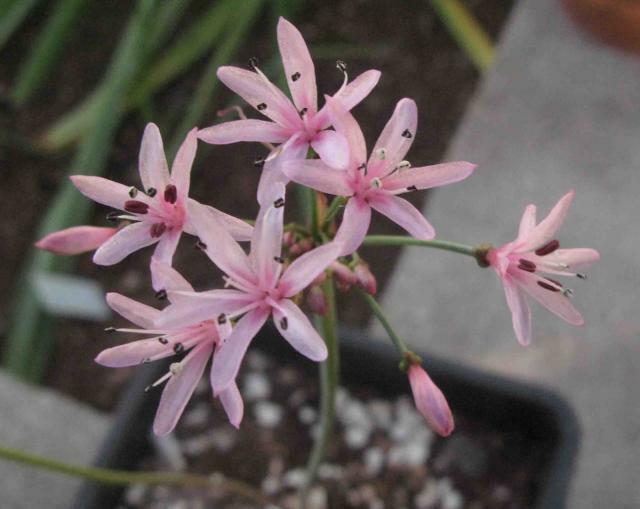 This plant was seed grown by Mary Sue Ittner and she sent it as a mature bulb to Pamela Slate (USDA zone 9-10) in late summer 2014 after it hadn't performed in her Northern California climate; photo 2 taken at the end of October 2014 shows it flowering. 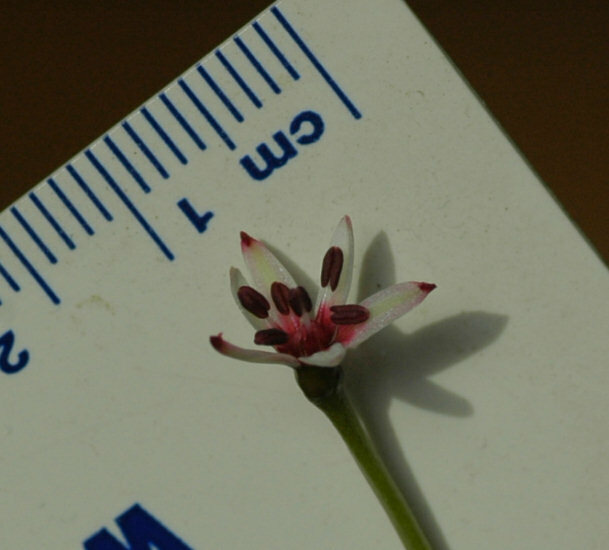 The two inflorescences measure 11 inches (28 cm) in height. The last two photos were taken on the 15th November; the pot is 6 inches square; seed formation can be seen at the base of the flowers. 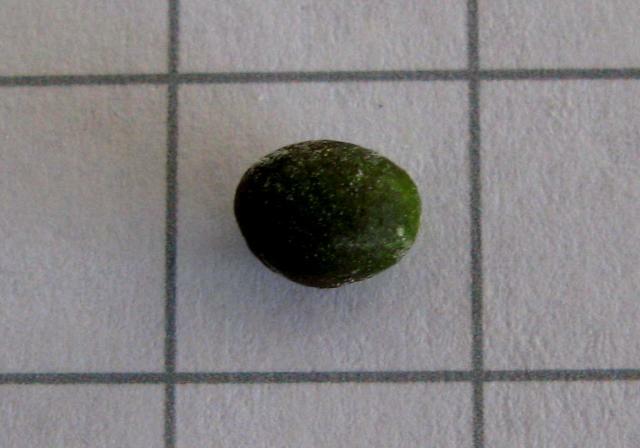 The next two photos taken by Pamela Slate on the 16th December 2014 show a drying flower and a seed, both on a 10 mm grid.